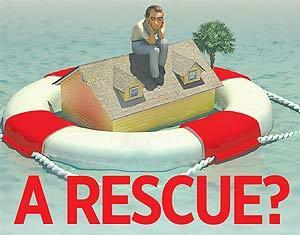 Post Foreclosure Rescue Schemes – Be on Alert! Our firm often represents borrowers whose homes may be the subject of a foreclosure action. While we attempt to resolve all such cases with the lending institutions, sometimes a foreclosure judgment and sale cannot be avoided, or has already occurred by the time the borrower seeks legal counsel. In such situations, the borrower needs to be on alert for possible “scams,” or individuals seeking to take advantage of a person in distress. Because foreclosure lawsuits and judgments are a matter of public record, it is easy for unscrupulous individuals or entities to obtain the name and address of the person whose home has been foreclosed and sold at auction. Because most auctions result in the property being sold back to the original lending institution, some people will claim that they have purchased the property from the lender. If the borrower is still living at the property, they will contact the borrower directly or leave a note at the property, requesting that the borrower contact them directly. We would recommend that if a defendant receives such communications, that they contact their attorney immediately. Using legal counsel will enable a person to avoid the high pressure tactics that these individuals may exert on the defaulting borrower, so that their desperation to reclaim the property or continue to live in it is not used to her disadvantage. The most important task for legal counsel is to first determine whether the person claiming to have purchased the property from the bank has actually done so, and the identity of the current owner with whom negotiations should commence. A last owner search or title search with a reputable title company will accurately inform the party whether the foreclosing bank has actually sold the property, and to what entity. This avoids the possibility that the person who has contacted the borrower is simply “fishing” for information and has not actually purchased the property. Potentially, they are checking to see if the owner still occupies the property, and attempting to ascertain the condition of the property for a possible purchase or seeking to collect rent to compensate for the occupancy. If the entity has actually purchased the property from the lender, then there will be a deed on file. It is important for legal counsel to obtain a copy of the deed to see if there are any restrictions on the transfer of the property. For example, many lenders who sell foreclosed properties want to avoid the purchaser doing a quick “flip” of the property by selling it back to the original owner or another party for a fast profit. Therefore, they may insert into the deed a restriction that the property cannot be resold for a period of time (often three to six months) for more than the purchaser paid the lender. For example, a lender forecloses a property and takes title through a foreclosure auction and sale. They then sell the property to a company which buys foreclosed properties for $150,000.00. The new deed contains a restriction that the company cannot resell the property for more than $150,000.00 within four months of the deed being recorded. Any owner seeking to repurchase their property should have counsel check the deed to make sure that any repurchase is in compliance with any such deed restrictions. Because many owners of foreclosed properties often remain in the premises after the foreclosure sale, they are vulnerable to companies seeking to take advantage of their misfortune. It is important to retain experienced counsel to ensure that any re-purchase of the premises is done in a legal manner and results in the original owner obtaining marketable title to the property.